A recent Vox article highlights how little teachers make for their education and experience. 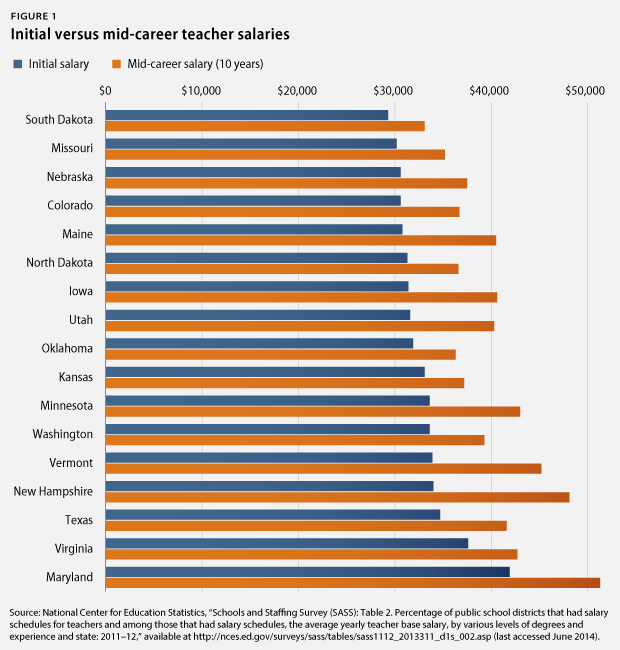 Nationally, average salary for a teacher with a bachelor’s degree and 10 years’ experience is $44,900…. In 18 states, teachers with a graduate degree and 10 years in the classroom still make less than $45,000 per year. As sad as my pay stubs from teaching seemed, these figures made me realize that the average teacher in the U.S. is even more poorly paid than I was. It gets worse: According to the report, teachers in some states are still making less than $40,000 with a bachelor’s and 10 years of experience. I am in SD [South Dakota] and we are at the bottom of the barrel for pay. I have my master’s plus 45 additional graduate hours after the master’s and my salary is still only $40,000. While I was in college, I was a shift manager at CVS. I have recently gotten in touch with my old store managers and I have been given a window of opportunity to become a store manager myself, starting out at $10,000 more a year than what I make now with my master’s in education. To add my own story: I have less than one year of experience at my current job, but I get paid about the same as I did as a teacher with 7 years of experience. And my current work is much less stressful than teaching, partly because I no longer have to do unpaid work at home. Yes, Teacher Appreciation Day is nice, and the intrinsic rewards of teaching are wonderful, but they only go so far. The Center for American Progress finds that the children of mid-career teachers in some states qualify for federal assistance programs, and that more than 20 percent of teachers in 11 states rely on income from working second jobs during the school year. As I’ve said before, teachers aren’t saints. They shouldn’t be expected to take vows of poverty, or to do their jobs just “for the kids.” Isn’t it absurd that so many are paying a personal price for doing such vital work? We all benefit from investing in teachers. Studies have shown that for every dollar spent on universal pre-k, we get at least $8 back in increased earnings, lowered spending and reduced crime. Other research shows that states with better educated workers have stronger economies, and that higher levels of education also correlate with improved health and lower mortality rates. What better returns could you ask for? As long as low teacher pay persists, however, we can expect more people do their own cost-benefit analysis, like I did, and quit.